Hinges: Which side of your home do you want the hinges to show? They are inside the home for In-swing and on the exterior for Out-swing. Space: How much space do you have? With an In-swing door, you need clearance inside your home to allow the door to open without hitting any furniture. For Out-swing, you need a clear path exiting the home to allow for the width of the door swinging outward. The new Milgard Essence Series® swing doors combine the beauty of a wood interior with the durability of a fiberglass exterior. When you are working with a pre-existing door opening or limited floor plan space, sliding patio doors are a great option. Designed with either a right-hand or left-hand operation, these doors slide along a horizontal track and can be customized with decorative handles, premium exterior colors, glass options and grid patterns. 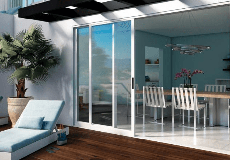 Tuscany® Series sliding patio doors with vinyl frames are very durable and virtually maintenance free. Moving Glass Wall Systems operate smoothly and effortlessly with the push of a finger, despite their large size. This is because they use sealed, stainless steel, ball bearing rollers. There are 3 options for moving glass walls. With a Bi-fold system, each panel of the door to folds on top of the adjacent panel as it opens. (Think of it like an accordion fold.) This creates a huge patio door opening that really lets the outside in. When full opened, the panels are stacked and folded against each other. This door works very well for replacement door projects because the weight of the door is bottom loaded. This means that you do not have to add a structural support beam into to the top of your wall to support the weight of the door. Bi-Fold walls are available in 4 aluminum colors. When stacking glass walls open, each panel stacks on top of each other, while it slides down the track, so, depending on the size of your opening, you could have between 3 and 6 tracks. When fully open, your living room extends into your patio space and your home is filled with natural light and fresh air. This options is also available with a Clad Wood interior frame, in addition to aluminum. If you want the panels of your patio doors to disappear from view when the door is open, you’ll want pocket glass walls. As the panels slide open, they are tucked into a wall pocket out of sight creating an open-air retreat. When the door is fully closed, the large door panels beautifully frame your scenic view. Consider thermally broken aluminum panels with a full weather-stripped structural interlock system if energy efficiency is key. All moving glass wall systems are available for replacement projects in custom or standard sizes or for new home construction in standard sizes only. A Milgard certified dealer can help determine the best option for you. Once you’ve chosen your patio door, it will be time to decorate! Consider a mix of sofas and chairs for ample seating. Decide if you want to carry the color palette of your interior through to the exterior space with pillows and rugs for a seamless transition. Or, define the space with a pop of color. Think of your patio as an extension of your living room, so, don’t forget dining tables, end tables and coffee tables as well as decorative pieces like candles, baskets or statuary. Whether you are trying to make a statement with an Essence Door as the focal point to your room or trying to bring the outdoors in with a Moving Glass Wall; Milgard has the solution to make it happen. My customers are loving the pocket Moving Glass Wall Systems. The door panels disappear in to the wall when open which really adds to the feeling of bringing the outdoors in. Great Post. I always have too much interest in interior designs whether its internal or external designs. You have explained in a good way. Keep it up !